I LOVE MR STINK!! Both the actual book and the character. I haven’t enjoyed a purely kid’s read so much in years. 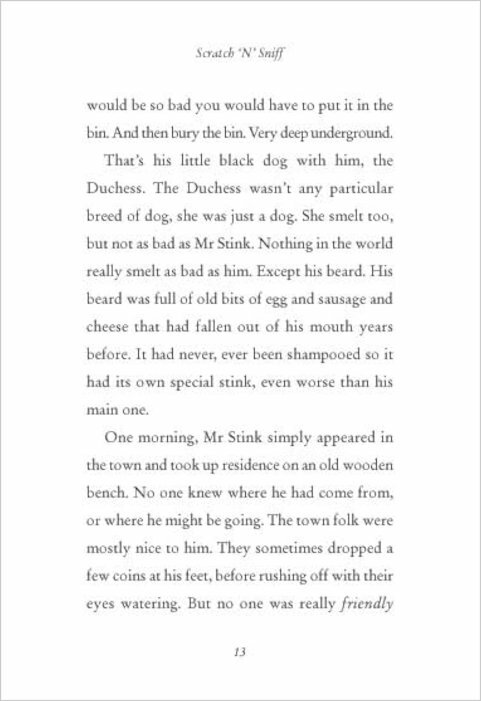 At first I was reluctant to give it a go, as I am suspicious of celebs penning or supposedly penning works of literature but Mr Stink was fab! It is cuttingly accurate without feeling spiteful, side spittingly funny and it has a joyous happy ending without being sentimental or cheesy! All this whilst being completely age appropriate. 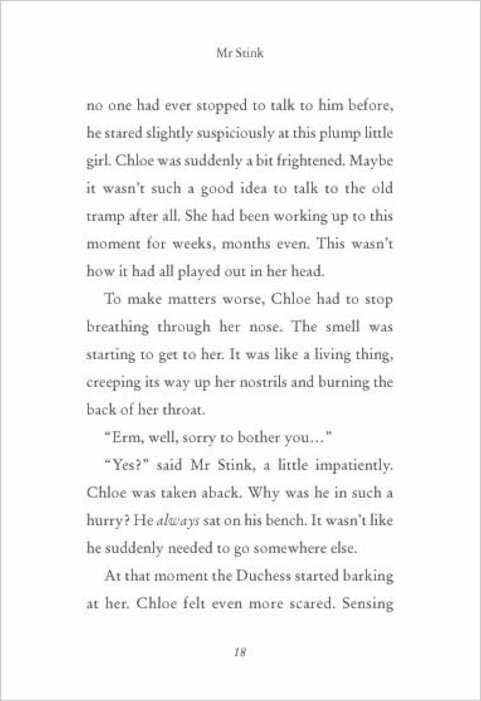 It tells the story of poor Chloe who is either neglected by or victimised by her nouveau riche mother, her rather Mr Bennet ish weak father and her snooty big sister Annabelle. Then one day everything changes when she meets gets talking to the rather wise local tramp Mr Stink. I think this book is so funny. And rude LOL! I have listened to the Audio CD with my twin brothers. I like listening to the time table that Annabelle has during the week. Some of the things she does like krumping sounded quite funny and a bit odd too. I definitely loved this book and would recommend it to anyone who loves a bit of humour. loved it, i’ve even seen the film on cbbc! BEST STORY EVER! This is an amazing book! If you fancy new friendships, betrayal, and a story full of secrets, then this book is for you! 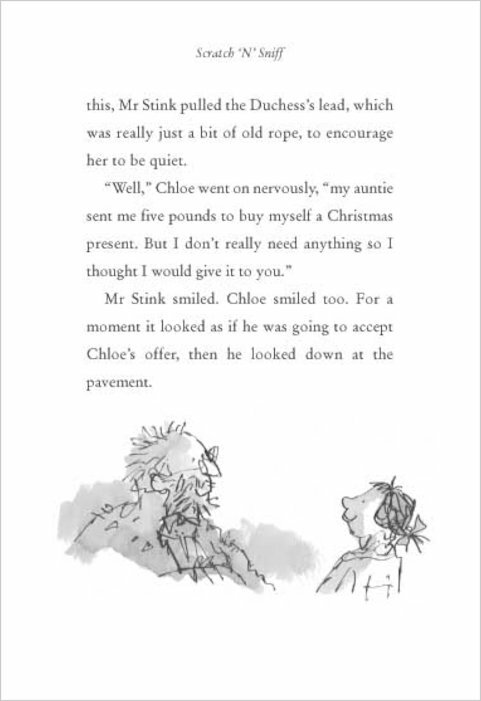 Mr Stink is a fantastic character, same goes to Chloe. I urge you to read this book! It’s simply incredible. i really like this book it has lots of humor in it and also lots of TOILET humor. It is just amazing writing such a book. Lots of children i know love this book so much ans i mean so much. WOW!!! I think this book is really amazing because it can make you laugh out loud, but also cry. It really made me realise that the homeless are actually people like me or you and that they can have interesting stories to tell. After all they don’t just end up there on the street just like that. I think everyone should read this book and think differently about homeless people. I personnaly LOVED this book. This book was really good the films good aswell I think this is one of my favourite books he’s wrote. This book is written by David Walliams.This book is funny, heartwarming, thoughtful and a enjoyable read. I command you to read this book because it is very funny and it is such an entertaining book. 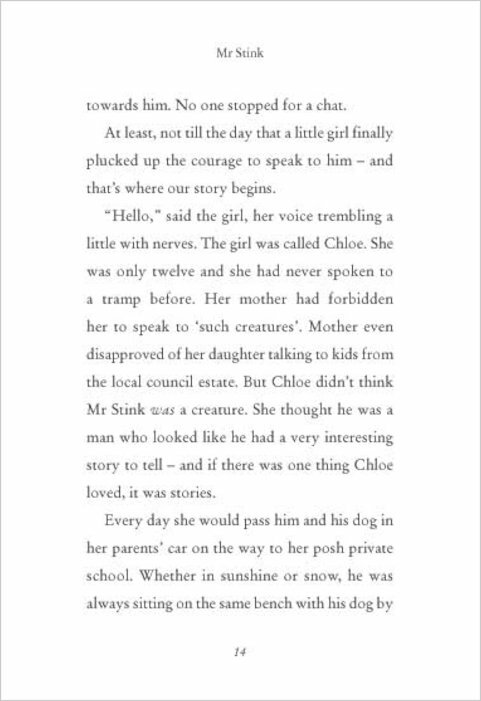 I warn you though you might cry because there are some very sad bits.This book is fiction but it tackles issues like being prejudice, bullying and homelessness. This book is such a wonderful and exciting book! This is an easy read book and it only took me one day. Do not let the book fool you,just because it is a thick book with over 200 pages.This book is not age limited anyone can read this book and I reccomend this book to all people. I ❤️ this story it is very funny and good. I really enjoyed this book because I found it really funny and interesting! When I first started to read the book Mr Stink ,I could not put it down, from start to finish it was hilarious! this is a very moving story.Would you do what chloe did? I loved Mr Stink! It was amazing! You will find it touching, sad and hilariously funny all at the same moment! The drawings, even though they’re not coloured in make it come into life even more! It is just sooo amazing!!!!!! I love the way that Mr Stink has a girlfriend called Violet and that his favourite drink is rotten orange juice. Mr Stink’s story is so sad. Especially when his wife dies. BRILLIANT… Do I need to say anything else? Mr stink is a really good book. 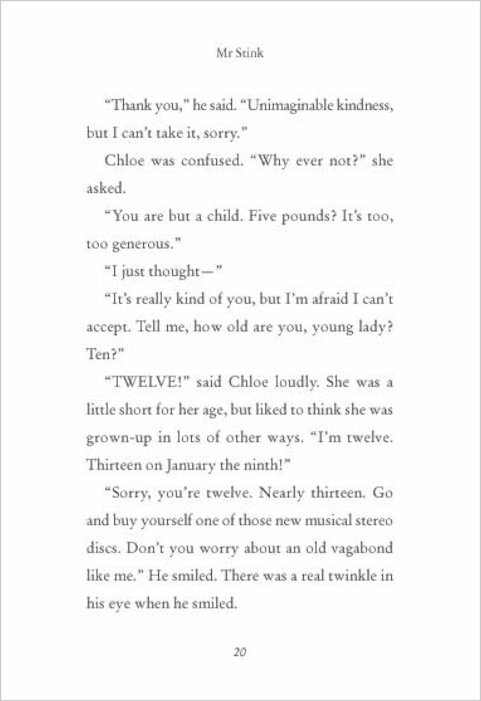 its about a girl called Chloe who meets a tramp that lives on the street. she ends up looking after him and his dog by letting them live in her garden shed. However when her mother finds out she is not pleased at all. This story is great!! i would give it 5 stars and recommend it to people age 9-14. 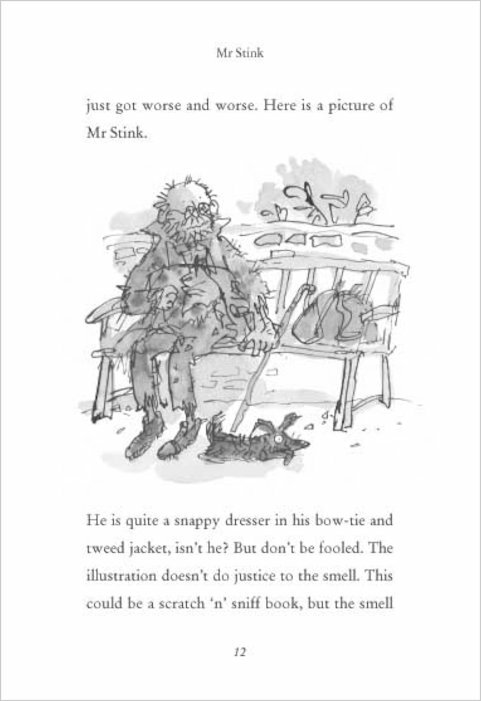 Mr Stink is an amazing book that goes to show that you can’t judge a person by what they look(or smell)like! 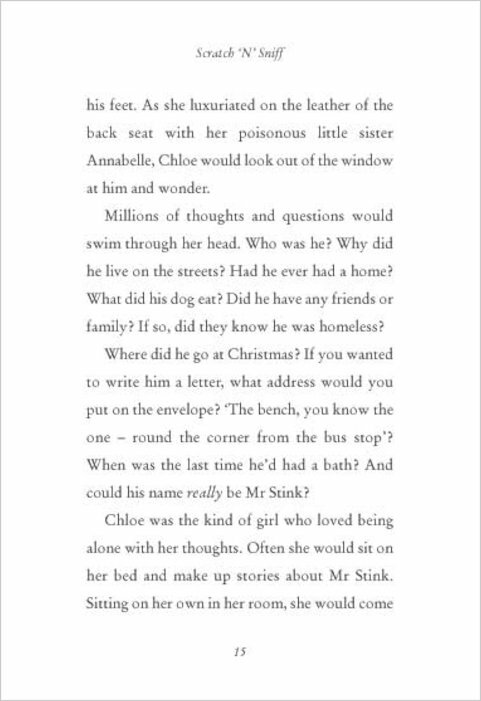 this is about a girl called chloe who befriends a tramp called mr stink. I thought it was very good and it suprised me of how david wallaims good come up with this brillant book. This book is hilarious, and you’ll never stop wanting to read it. i love all of this book but i dont know how to read it kept on pressing on the i wnt to read thing and it wouldent let me read it but i rally want to read this fantastic book i love all of the pepole have got it in my school i just love it have read the first page in my friends book but then sh took because it hers if you know PLEASE PLEASE message me because i dont how to read the books if you do please anser me. This book is amusing,entertaining and most definetly heartwarming! It kind of teaches us a lesson, like don’t judge a person by their looks! It’s so funny and one of the best books I have ever read!!!!!!!!!!!!! I recommend ANYONE age 9+ to read this book now! I also enjoyed other David Walliam’s books inculding the demon dentist, Gangsta Granny and Billionare Boy! This book is the best I have ever read. At points I laughed out loud, at other times I sobbed. Very emotional. A hilarious book, about a girl who meets a tramp. a very funny book. you should get it. Love david walliams books. he is so funny! really funny book and a little bit sad at some places. if you like this book i recommend the short bbc film on this. 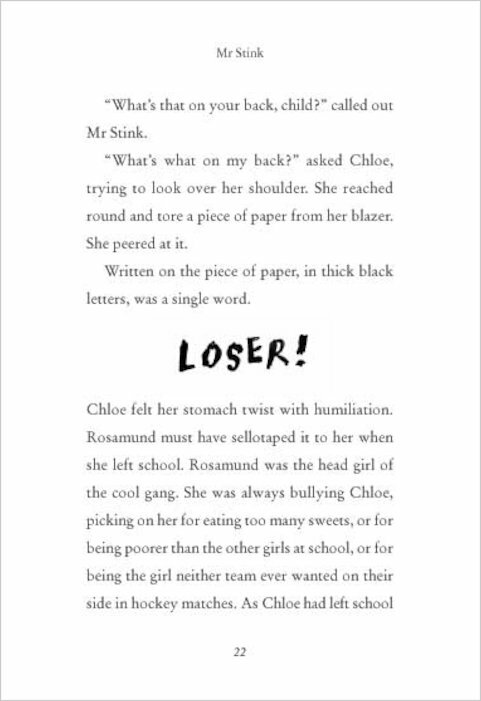 This book is about about a girl called Chloe who befriends a tramp called mr stink. Wonderful, all about what things appear to be. But actually being different. Was a great read. it was really good but it started out a bit iffy but it got better and better the film of it is really good as well. Amazing, it was really funny! Our teacher read us a chapter or so a day! it’s a really cool book with lots of funny parts in it i would give it a five star!!!!! brilliant! this book really captured me at the end! it was funny and sad. I thought this book was amazing it was hilarious I could not stop laughing the whole way though it was abousltly extrodanary and i could not stop reading it was amazing and…I CAN NOT DESCRIBE IT IT WAS TO GOOD FOR ME!!! This is a truly great book. 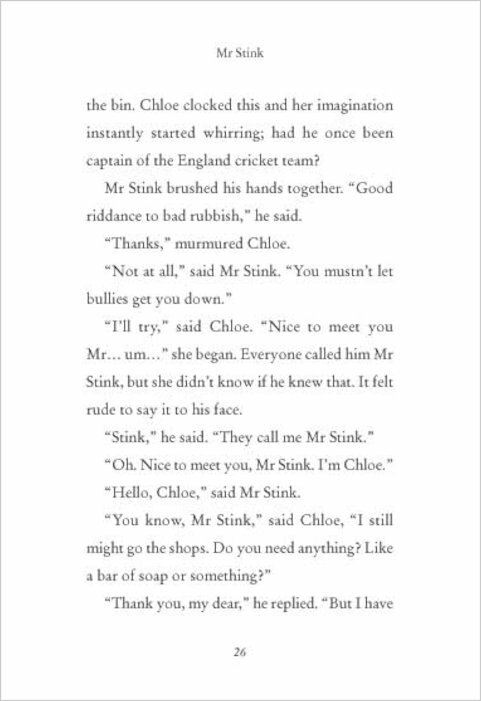 The best bit is when Chloe hides MR Stink in the shed. my friends got this and there are loads more copies. Hopefully i will get one! sounds good. I csnt desribe the book it is full of mischief and action…. and of course smelly stuff ! Poor Mr Stink! * * * * *! David Walliams writes really good kids books! this book is hilarious! finally, chloe has a friend! This is hilarious! It is entertaining, fun and light! Perfect! 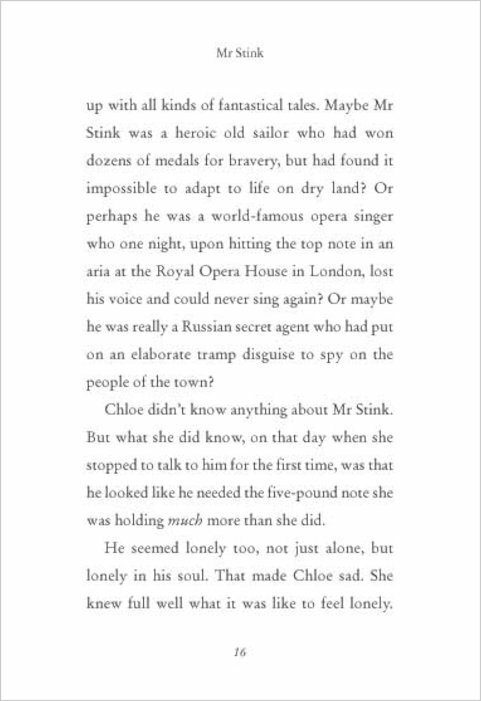 i think chloe is rely brave to talk to mr.stink and this book is good but not as good as the others. this book was touching….. in a way!!! I enjoyed how the story led a different path wondering what would happen next. 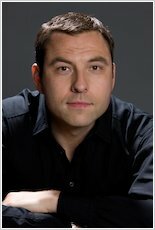 David Walliams is a classic writer and is very funny!! As a comedian and a writer. Its been quite a while since i’ve read this but I still have many things to say about it. I assume you that there are no cons but many pros. To summarise it all its basically just hilarious. 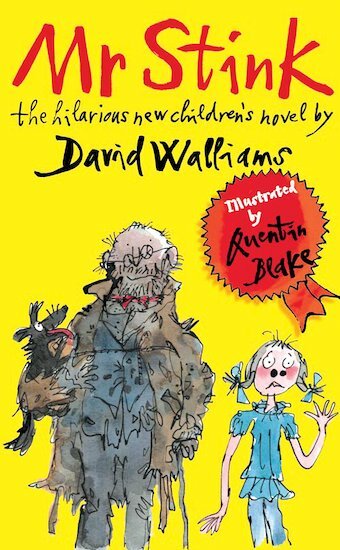 I think this book is a good book to read i would give it an q0 out of 10 becuase it is funny aswell becuase there is a man and he is called mr stink he only baths once a year. If you get this book, you’re sure to love it! I thought this book is brilliant. 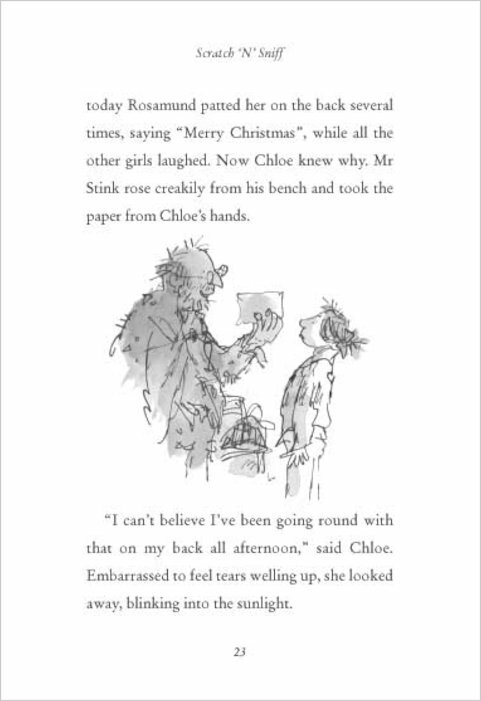 My favourite character was Chloe because she is kind to Mr Stink especially when she invites him to come and stay in there garden shed. I think I would recommend this book to a girl aged 9-11. Chloe, who is 12 years old has a very posh mother and younger sister. They live all together in a house. 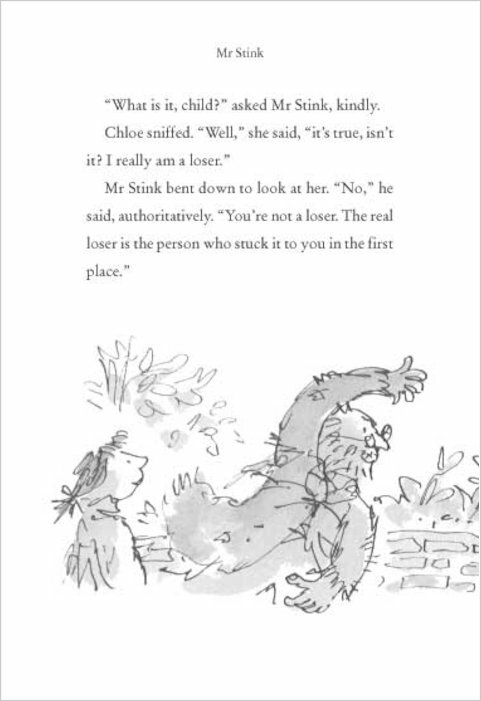 Every time Chloe goes past a tramp which everyone calls Mr Stink when walking down the street. One day she picked up her nerve to talk to him. After days and days of speaking to Mr Stink, she had all these ideas that he might have been a robber or a rich person that is trying to hide it – like a secret millionaire! Mr Stink also has a dog. I love this book and could read it a again and agin. It’s aimed for 9-11 year olds and both girls and boys will love it too. I think David Walliams is a really good author. 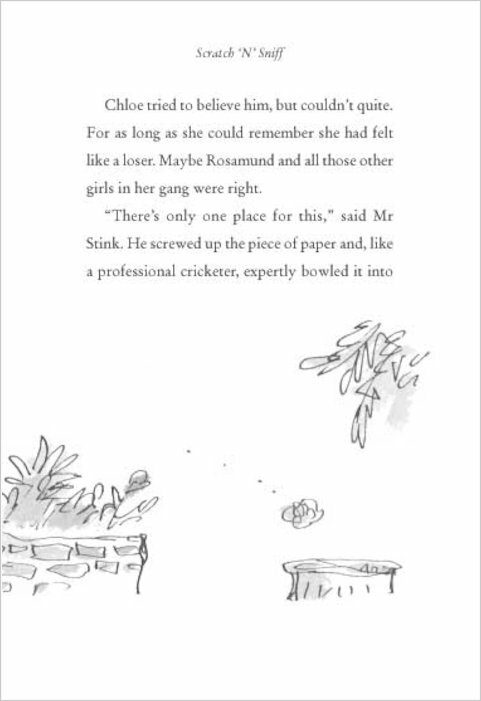 Mr Stink was a fantastic book but a bit sad at the end. ITS GREAT U NEED TO READ IT!!!!!!!!!!! This book was BRILLIANT.In the end Mr Stink had to leave,because he was a wander. Wasn’t sure wehther I was going to enjoy this book or not but didn’t put it down. The story is about a young girl who feels very unhappy and lonely and who comes from rich family. One day she meets a man on the street and names him Mr Stink, from there their relationship blossoms. An excellent read. Another great book from David Walliams. This ones not quite as good ‘The Boy In The Dress’, in my opinion but it’s a funny read with a serious message or two. 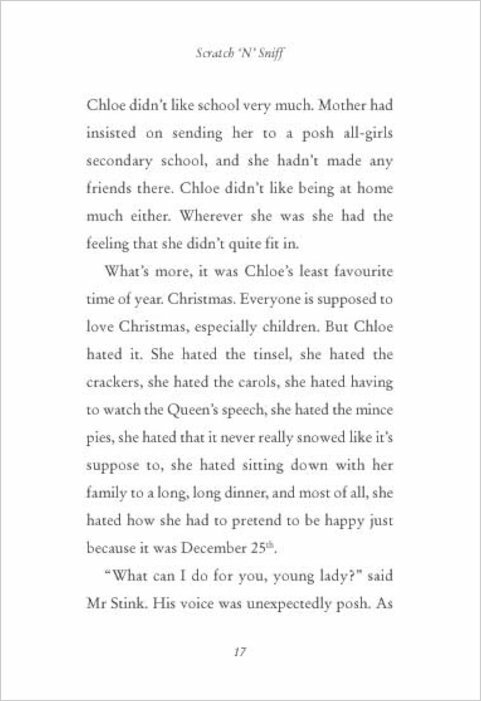 The story follows a young school girl called Chloe, who feels lonely and unhappy at school and home. 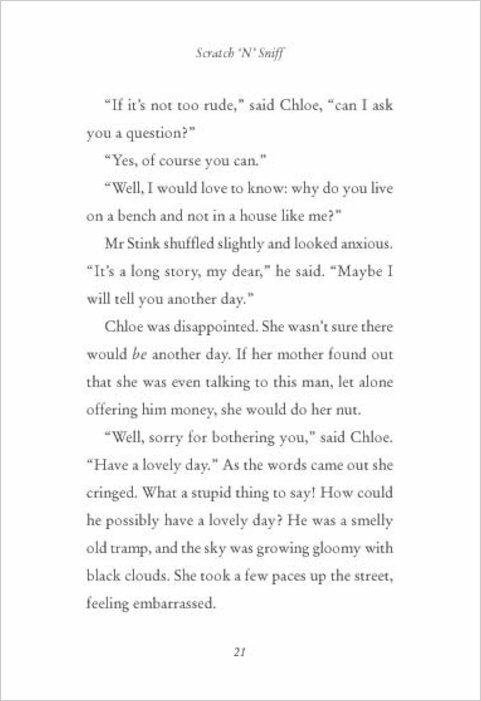 One day she meets a tramp, Mr Stink, and over the course of the story Mr Stink moves into their garden shed and before moving on, helps turn their unhappy family into a happier one. The stuck-up Mrs Crumb and Chloe’s awful sister inparticular begin to realise the value of their own family. A satisfactory read and I’m looking forward to his next book.